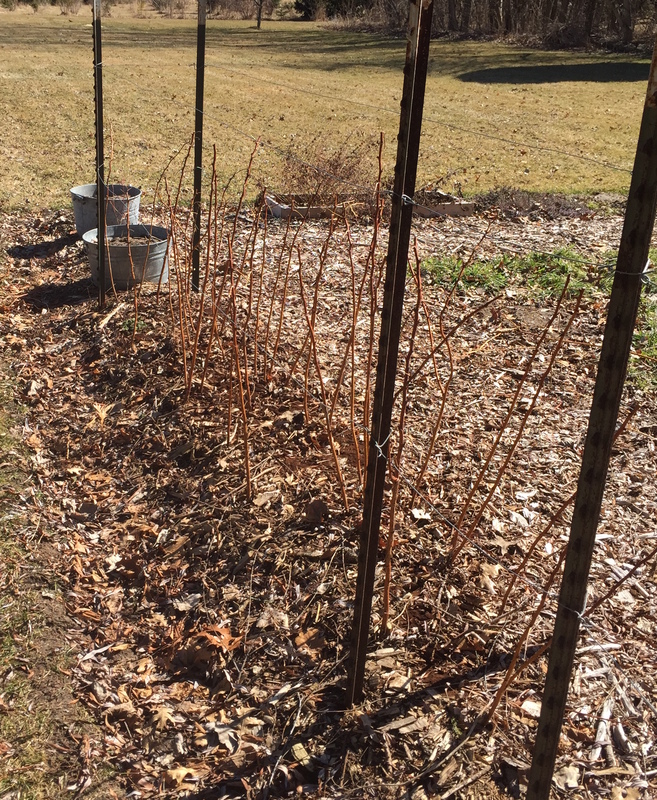 Late winter is the time to prune raspberry bushes. I’m not trying to present a how-to here. There are plenty of those available from better gardeners than me online. This is just how I accomplish what works for me. 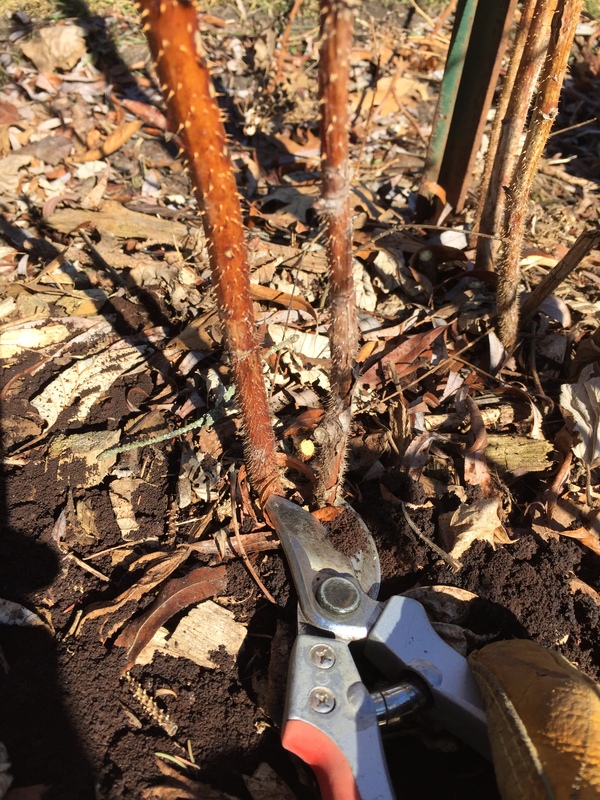 The floricanes (that’s what second year canes are called) all get pruned to ground level. 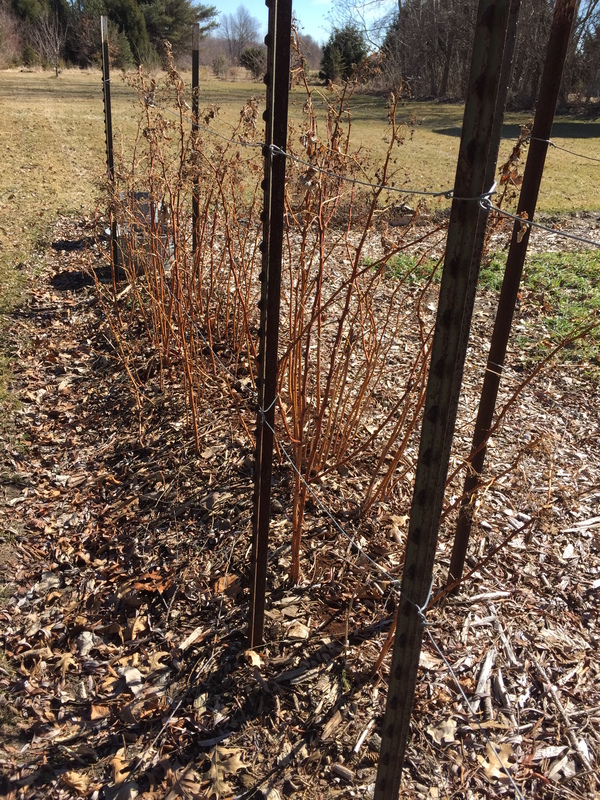 Any spindly or dead-looking canes come out. Then I thin what’s left to 5 or 6 canes per foot of row. That makes for more vigorous plants and a better yield of larger berries. I also take out any canes that think they need to live in the suburbs. And on a totally unrelated subject, the worms are happy. Last Thanksgiving my wife hollowed out some mini-pumpkins for candle holders. I set some aside, outside, and they froze over the winter. The other day I brought them in and defrosted them into a yucky pile and buried them in the worm bin. Worm heaven. They love anything to do with the melon family. You’ll notice a ton of small white flecks in the bin. Gross, eh? They’re called springtails. I was pretty alarmed when they first appeared after starting the bin. They usually grow in bins where there’s too much moisture. That’s something I try to keep an eye on, but don’t stress about. 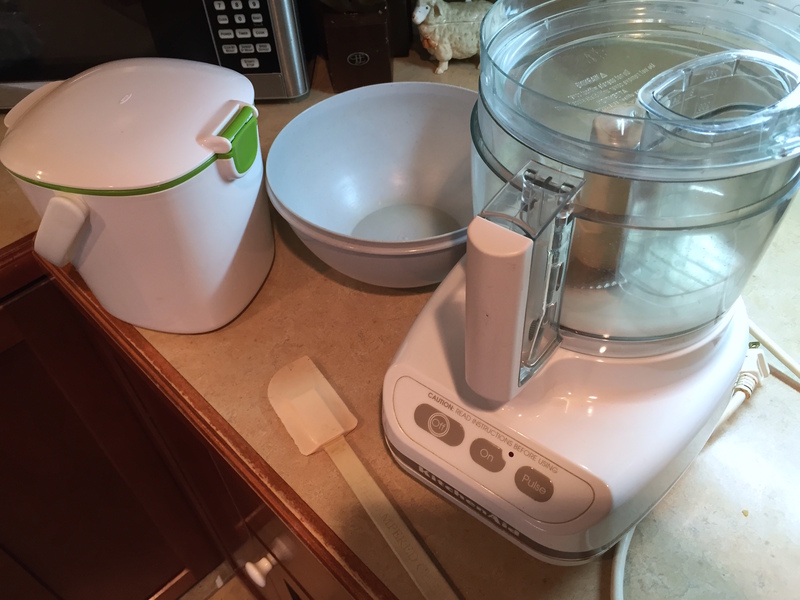 I just open the lid for a while and let it dry out. After living with springtails and reading about them, I decided they’re almost welcome. They exist peaceably with the worms and help digest all the goodies. They won’t overrun the house or eat my pets. They just take a little getting used to. I have a guilty pleasure. AhhhhI’m not sure it would rank anywhere in humanity’s top 1 million. But it’s in my top 10. This isn’t for public consumption, so please don’t repeat. Sometimes I go into my grow room, close the curtain, lift the lid of a five gallon bucket, and run my hands through my little stockpile of finished worm castings. I said it. I’m not ashamed, much. I wish I could convey what they feel like in the dead of winter, or anytime for that matter. I wish I could capture how light and fluffy they are with an image. 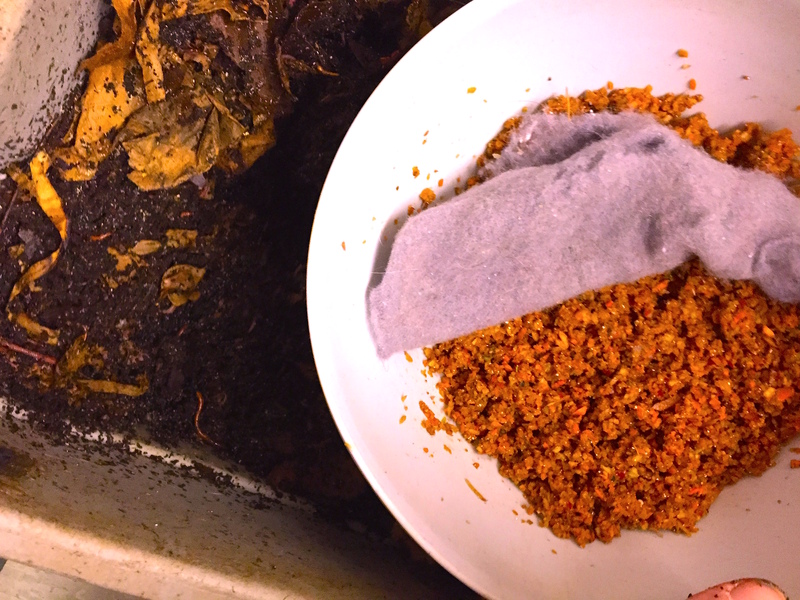 Screened through 1/4″ hardware cloth, aired out on a board till they contain perfect moisture, lighter than soil, meatier than seed-starting mix…man. Yeah, a little perverted. But they’re so perfect. I think it’s as much the aura as the substance; what they do when they’re suspended in bubbling water and molasses for a day, what they do in the bottom of a tomato hole or sprinkled into potting mix. Such a perfect substance, from waste, to waste, to creation. I wish I could capture for you how they feel falling through fingers. Light and airy, but full and heavy. Perfect. Yesterday was the Holiday of WormFestivus, a weekly celebration of gunky schmutz. It happens every Friday in my world. It’s time to feed the worms. At the beginning of the winter I thought I’d sacrifice a few worms in hopes of furthering the cause of science. No, I lie. It just seemed fun and interesting. A handful of worms, a buried cold frame, a bucket of water, an aquarium heater and some bedding. 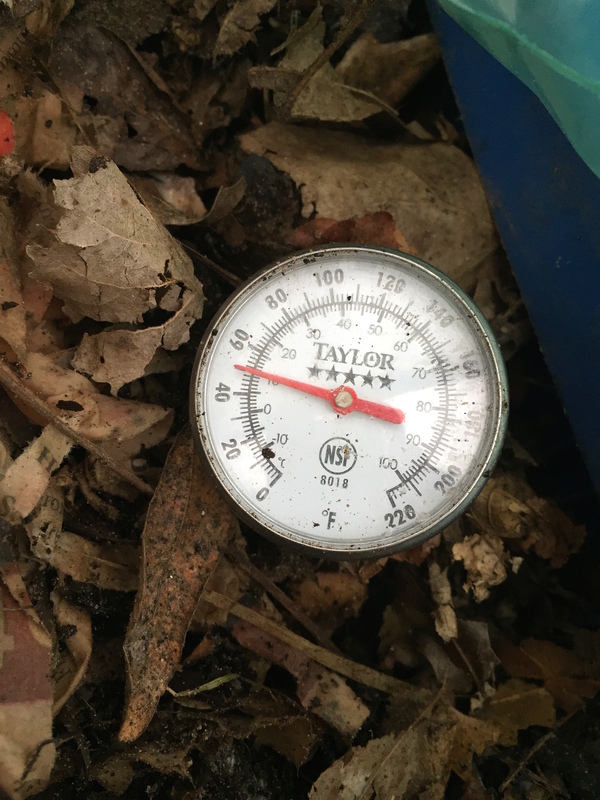 The heated water held the soil temperature pretty well for a couple of months. Temperatures next to the bucket pushed 80 with outside temps in the 20s. I didn’t want to open the frame too often for fear of cooling things off. But yesterday the weather warmed to a balmy 37 degrees, and I popped the lid. The first thing I saw was a nice fat vole racing across the surface, disappearing into the litter. Most likely engorged with worms. And there were some worms..about five nice ones drowned at the bottom of the water bucket. I poked around in the bedding a little, but didn’t see anything else. The temperature? It didn’t really surprise me that much. Nature is brutally honest. More insulation next time, maybe cover the cold frame with a hoop house. Definitely some hardware mesh underneath. That’s the killer about garden experiments; you generally get one shot a year. I think red wigglers can sometimes survive temperatures that low, but it ain’t likely. I’m not giving up hope yet though. Some experienced wormers say that when worms sense they’re about to meet their demise, they get in some last-minute whoopee (great plan) and the eggs hatch when things warm up. We’ll see. I’m not sorry that I tried. I only use a couple of handfuls of vermicompost to make 5 gallons of tea, enough to spray my whole garden, with plenty left over for the flowers or planting holes or homemade potting mix. I stockpile castings through the winter in a 5 gallon bucket with the lid slightly ajar, to keep the microbes and geegaws that make it so good supplied with air so they can continue to do their thing. And I’ll repeat what I said to myself earlier out loud. ‘Holy crap, there’s a lot of worms’. Might have to expand to two bins. Maybe even try an outside bin if my experiment shows any promise. It’s the best thing in life to love what you do. Is it proper etiquette to post more than one blog entry concerning used coffee grounds in the same month? Try to look that one up. Yesterday I hefted another 60 lbs. of used coffee grounds home from Starbucks. What a great feeling. But as chance would have it, a comment from Julie (who has a great blog called Julie’s Garden Ramblings) made me envious and curious. She said that I would laugh if I saw her stack, and that she’ll never run out. I’ve been trying to moderate my excess garden enthusiasms. Could I ever have too many coffee grounds? I suspect that there probably isn’t a definitive answer to be had on the Internet. Too many LOUD ‘EXPERTS’ and not enough quiet experts. But you learn to pick your sources. If you can’t believe a research manager at Rodale, you’re a bigger skeptic than I am. Anyway series of articles at Green Talk were very informative. All about coffee grounds and gardening, and I think from one of the quiet experts. Luckily I connected with Dr. Paul Hepperly, the research and training manager at the Institute, who is a well known authority in organic agriculture. Surely, he would know. (Fingers crossed.) He explained that once the coffee grounds are added to the soil, they start to decompose, and in turn, their acidity neutralizes. Ultimately, they are only adding nitrogen to the soil. His suggestion was to side dress the plant with no more than one inch at a time. He further caution to not add more grounds until the original grounds had decomposed. Coffee grounds are solely a soil amendment and not a fertilizer. He further explained that soil should have an organic matter of five to eight percent. 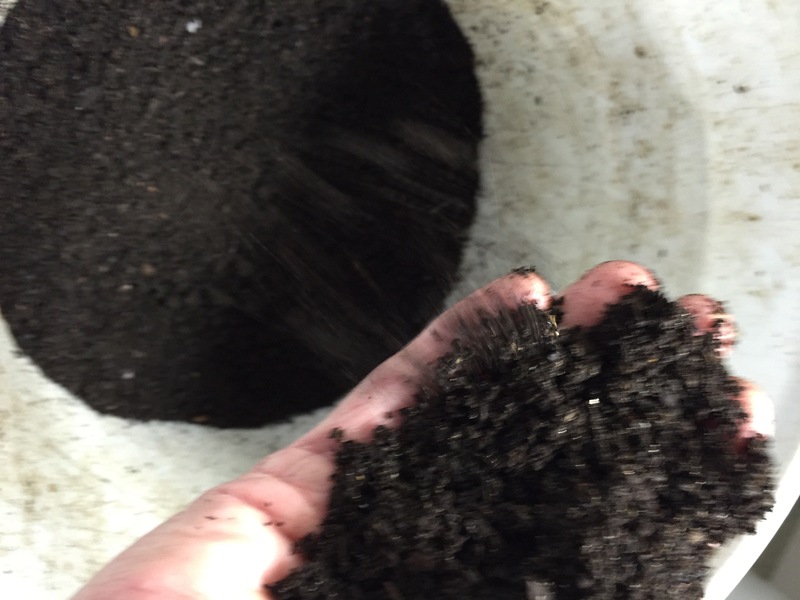 At some point, there is a diminishing return if you keep adding coffee grounds, and your soil has already reached the eight percent threshold of organic material. It will not hurt the soil, but may not help much at that point. It is best to take a soil sample during the year to see what your soil needs. My uses for coffee grounds are A) as worm heroin, B) as composted green matter, and occasionally C) as a top-dressing around the raspberry bushes. 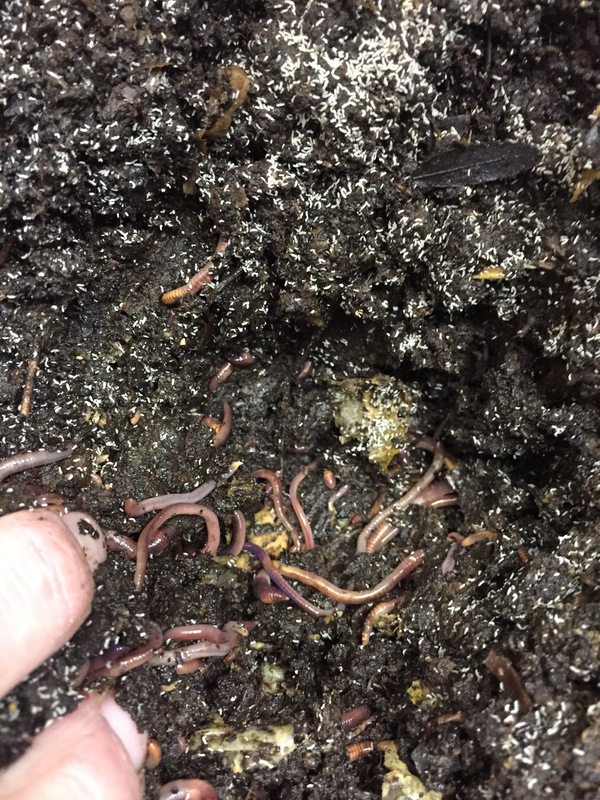 One problem with using coffee grounds in the worm bin is the moisture content. 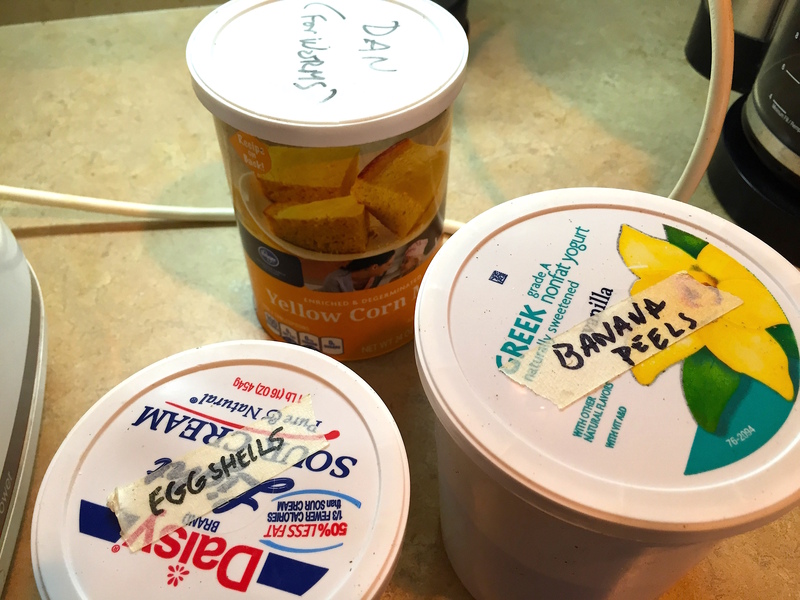 In my experience it tends to make everything in the bin a little sloppy. Other than that I do believe that the worms would happily live in pure grounds. Fact way back when I was a little shaver, my neighbor kept his fishing worms in pure coffee grounds, and they looked very happy. As far as garden compost and coffee grounds, the 1 to 3 ratio suggested confirmed what I had experienced as an effective ratio in my own piles. I rarely add un-composted grounds directly to the garden, and if I do, it’s with plenty of time allowed for their breaking down. 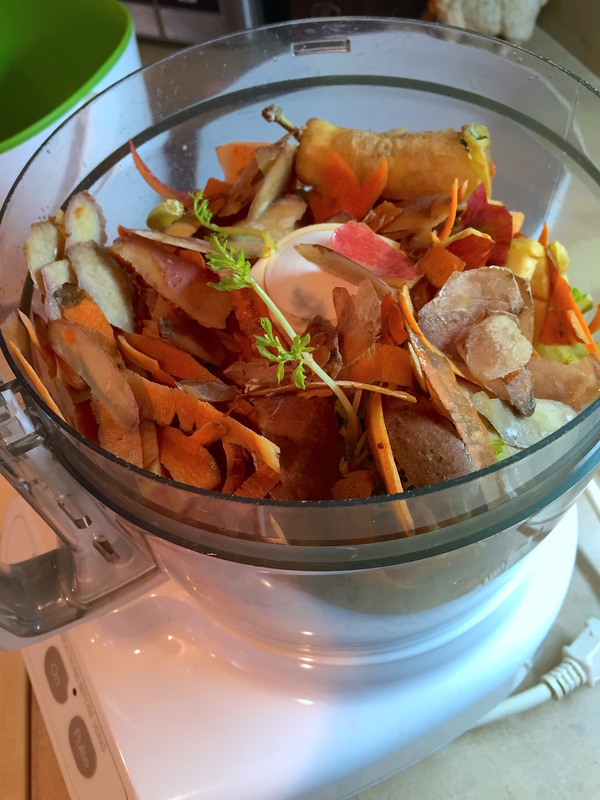 So in my long-winded way, the question has the same answer as my ‘Too much compost?’ question…moderation in all things. Boring, I know. It’s going to be a long winter, as always. And like every winter, this one needs an obsession. Last year’s was delving in to what I had skimmed over for decades. The garden, the soil, the basics. This year’s obsession will likely be more specific. 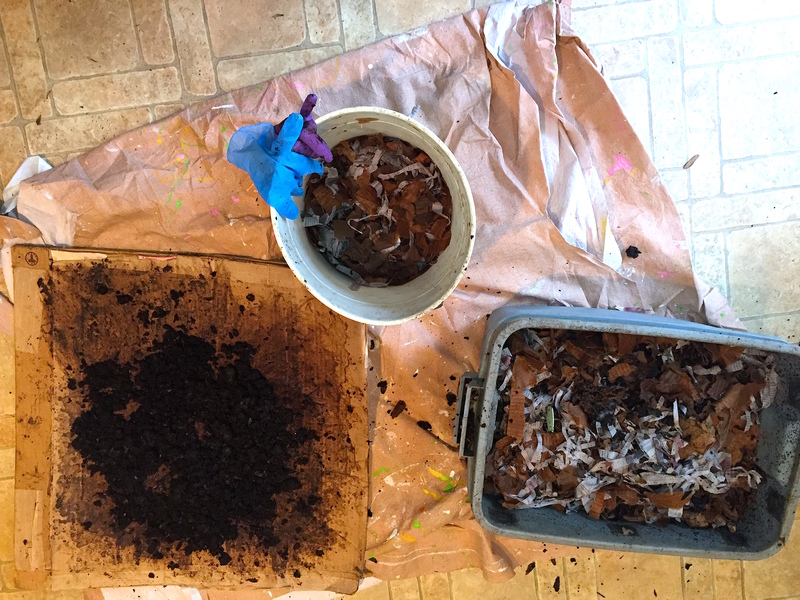 I’m a novice vermicomposter. That will change, but what better time to speed it along than frigid, white winter? 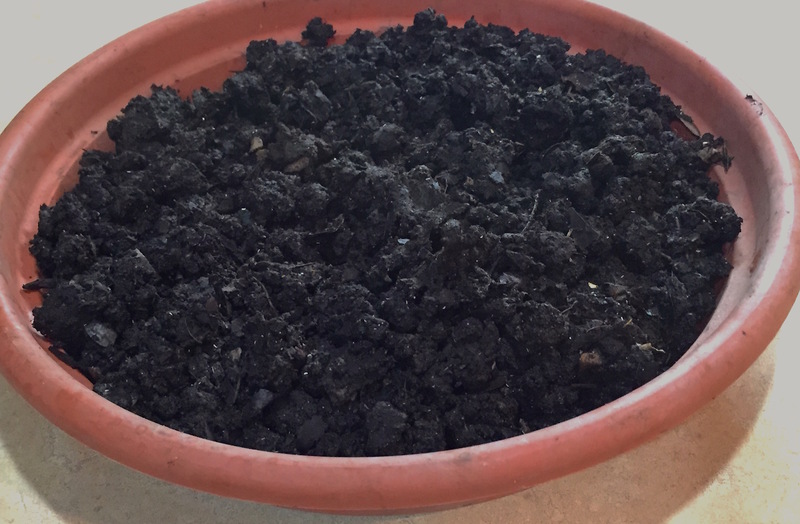 Vermicompost is superior to most composts as an inoculant in the production of compost teas. That’s enough for me. That, and the actual results of spraying my vegetable and fruit crops with worm tea last year. There are no doubts in my mind that vermicompost tea, used diligently, is magical. Of 38 gardens, this year’s gave me the highest yields and healthiest plants of any, and by a long shot. 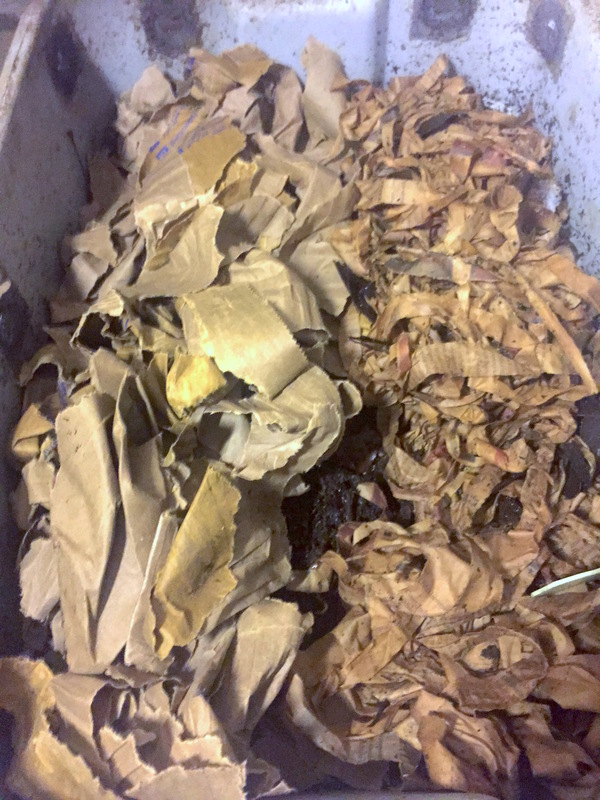 Half of my little bin is now covered with wet corrugated cardboard, half with shredded newspaper. The guys like to eat and make whoopee just beneath this layer. We’ll see if either side makes a better food-bed.